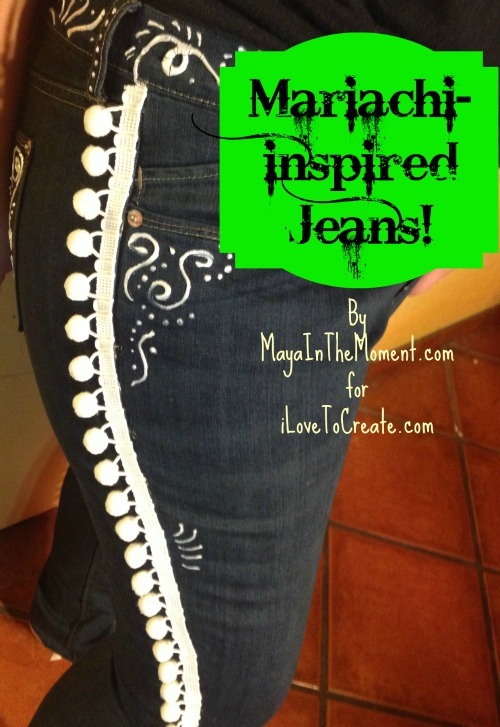 Make Your Own Mariachi Pants! I’ve been so busy with finals that I forgot the share last week’s craft project for iLoveToCreate! My dad helped me make these crazy and kooky mariachi-inspired pants! Yes, I really wore them out last weekend too! Mexican spirit, style and music should be celebrated all year long, not just on Cinco de Mayo, right???? Speaking of mariachi music – check out my friend’s band called METALACHI! It’s heavy metal and mariachi combined! Look out for the violinist, he is a longtime family friend and is amazingly talented, he’s Quetzal Guerrero. Que padre su pants. Hay algunos Mariachis en Miami que tocan muy bien. Seria bueno irme en un pantalon asi la siguiente vez que voy.